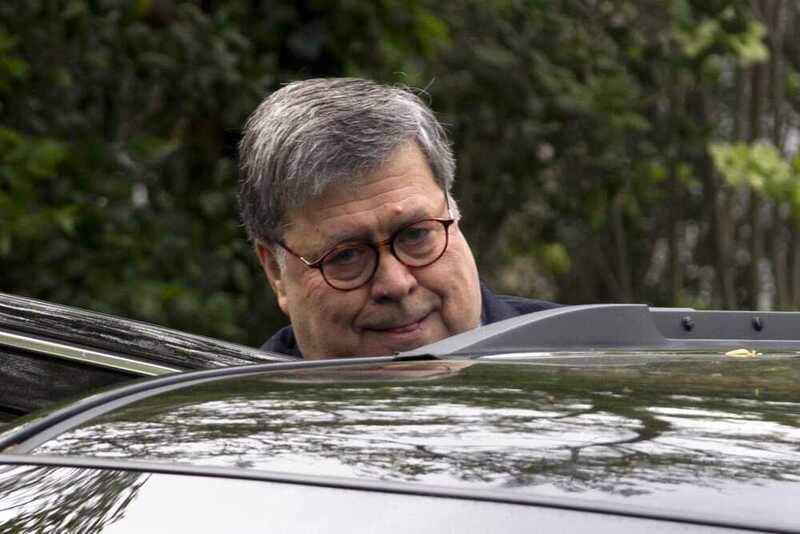 Attorney General William Barr leaves his home in McLean, Virginia, on Monday. Barr said he expects to release his redacted version of special counsel Robert Mueller's Trump-Russia investigation report Thursday. WASHINGTON -- The president isn't waiting. As Washington counts down the final hours until publication of the redacted special counsel report -- expected Thursday -- Donald Trump stepped up his attacks Monday in an effort to undermine potential disclosures on Russia, his 2016 campaign and the aftermath. He unleashed a series of tweets focusing on the previously released summary of special counsel Robert Mueller's conclusions -- including a crucial one on obstruction of justice Trump again misrepresented -- produced by Attorney General William Barr. Democrats are calling for Mueller himself to testify before Congress and have expressed concern Barr will order unnecessary censoring of the report to protect the president. The House Judiciary Committee, led by Rep. Jerry Nadler of New York, is poised to try to compel Barr to turn over an unredacted copy as well as the report's underlying investigative files. The Justice Department announced Monday it expects to release the redacted version Thursday morning, sending the findings of the nearly two-year probe to Congress and making them available to the public. Mueller officially concluded his investigation late last month and submitted the confidential report to Barr. Two days later, the attorney general sent Congress a four-page letter detailing Mueller's "principal conclusions." In his letter, Barr said the special counsel did not find a criminal conspiracy between Russia and Trump associates during the campaign. However, contrary to Trump's false claim, Mueller did not reach a conclusion on whether Trump obstructed justice. Instead, Mueller presented evidence on both sides of that question. Barr said he did not believe the evidence was sufficient to prove Trump had obstructed justice, but he noted Mueller's team did not exonerate the president. Portions of the report being released by the Justice Department will be redacted to protect grand jury material, sensitive intelligence, matters affecting ongoing investigations and damage to the privacy rights of third parties, the attorney general has said. They have painted House Democrats' investigations as partisan overreach and have targeted news outlets and individual reporters they say have promoted the collusion story. The president himself seethed at a political rally the whole thing was an attempt "to tear up the fabric of our great democracy." He has told confidants in recent days he was certain the full report would back up his claims of vindication but was also convinced the media would manipulate the findings in an effort to damage him, according to two Republicans close to the White House not authorized to speak publicly about private conversations. In the waiting game's final days, the White House continued to try to shape the narrative. But Trump's inner circle knows there will likely be further releases of embarrassing or politically damaging information. Barr's letter, for instance, hinted there would be at least one unknown action by the president Mueller examined as a possible act of obstruction. A number of White House aides have privately said they are eager for all Russia stories, good or bad, to fade from the headlines. And there is fear among some presidential confidants the rush to spike the football in celebration could backfire if bombshell new information emerges.